HTC One M9 Selfie camera tested: is UltraPixel producing ultra-good selfies? In the last two years, HTC had an unique solution - while competition was offering 8-megapixel, 13-, 16- or even 20- megapixel cameras, HTC decided to equip its flagship with an 4-megapixel one. They call it an "UltraPixel" camera, because it has smaller resolution but normally sized sensor, resulting in larger pixel size. This year's HTC One model - the M9 - is no longer featuring an "UltraPixel" main camera, but a StandardPixel 20-megapixel. However, the UtraPixel lives with the front selfie camera, which has 4-megapixel 16:9 resolution. ...the HTC One M9 addresses low-light shots with a powerful UltraPixel™ front-facing camera. Dynamic auto exposure and UltraPixels that capture 300% more light than standard cameras deliver sharper, more natural and balanced self-portraits in any lighting conditions. So, are these "300% more light" beneficial? Is the M9's UltraPixel camera the best selfie camera? We tested it, and can prove that it is a great one, but not the best. For comparison, we used the Huawei Ascend Mate7, which features a "standard" 5-megapixel selfie cam - a good one, but not a great one (the Huawei Ascend P7 has superior 8-megapixel unit) - and the results are somewhat on par. The M9's selfie really preserves pretty good details in the objects nearby - e.g. your face. It also has good color fidelity, while the Mate7's photos turned out somewhat washed out in this rather low light conditions. However, the Mate7 was the one with better details in the background, as the M9's photos have more blurred background. It is not bokeh-like though, so is it a good or a bad thing? You decide. However, M9's selfie cam's most serious drawback is its viewing angle. It is rather narrow, meaning that it would be hard for you to fit 3 or more people in a group selfie - you will definitely have to stretch your arm. This would be a smaller problem if the M9 offered a panorama/wide-selfie mode, but it doesn't. Still, this is just a software feature, so we hope HTC will add one, following the example of Huawei (P7 and Mate7) and Samsung Galaxy S6 (Edge) (which, by the way, also have pretty good selfie cams). 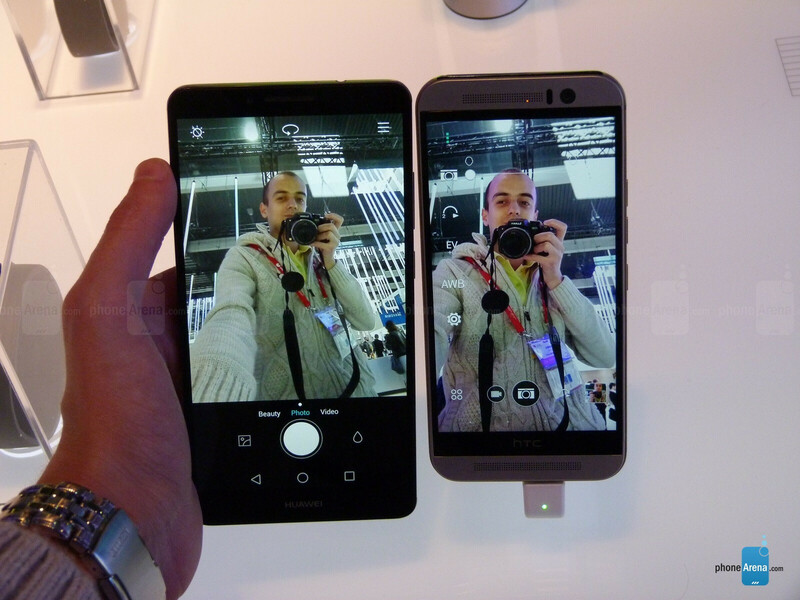 Below, you will find a few photos that we took at MWC 2015 with both the HTC One M9 and the Mate7. Both were set in full resolution and with minimum "beauty mode" setting, to preserve the finest details possible. Which selfie cam do you like more? I want to see the difference with the S6, front facing camera. Battle of the flagships. PA, I think this is a bug. I posted a comment and tried to edit it for the second time but it displays "Loading..." instead of displaying my actual comment. Hey look a new PA author. Trust me, he's been here for longer than you think. He's new in (english) journalism, I can tell from the composition. I don't mean to offend though. Probably a bigger sized sensor on the M9 and thus a different lens construction with different (less wide) focal length. M9 by a long margin, the only drawback is the lense isn't wide enough, should've atleast offered a Wide Selfie mode like the one found in Huawei and Samsung phones. The HTC One M9 is too bright! The colours are unrealistic. Whenever PA tries to make a post about photography I'm always wondering how far they are going in showing their photographic ignorance... :( So, without further ado, let's dive in: "However, the Mate7 was the one with better details in the background, as the M9's photos have more blurred background. It is not bokeh-like though, so is it a good or a bad thing?" PA wouldn't know bokeh if it crashed on it's face. Of course it is bokeh. Of course the Mate7's picture used a smaller aperture and thus has more DOF. And of course, if you knew the basics of photography, you wouldn't want any details in the background. Everything in this comparison points to either a bigger sensor on the M9 or a faster lens or a combination of both, which all favor the M9. Note, you could argue that the lens FOCAL distance has a big influence in DOF (which is true) but so does the subject FOCUS distance, but these two variables will compensate each other with the necessarily different framing. Sensor size direclty affects focal distance, so, in the end, it's all about lens speed. It's a clear win for the M9. Case dismissed! You are right, duartix - the blurred background is result of DOF, and yes, this is because the sensor is larger (that's why they say it collects 300% more light than standard 4mp selfie). However, is this "artistic bokeh" effect helping your selfies look better, or is it just a shallower depth of focus resulting in blurry *d*efect? You decide! Don't just blame PA, the majority of PA readers in the DSLR comparison article interpreted DoF and Bokeh as bad picture quality and subsequently chose the iP6 or Note 4 instead. He just point it ot if you like bokeh or not, IMO its pointless to have bokeh in selfie. and wide viewing angle is more important for selfie, huawei win. GOD why am I talking about selfie I don't care LOL. You didn't fully understand (or so it looks). You can have it with bokeh or you can have it with detail. The M9 will give you that choice by using a larger or smaller aperture. In the Huawei (which is a spectacular smartphone and would be my first choice for other reasons that have nothing to do with selfies) it's either detail or detail. If going wider is the problem with the M9, you always attach a wide angle addon. Sure, it's a nuisassance, but it's possible. What you cannot do is add a faster lens to the Huawei. "You can have it with bokeh or you can have it with detail. The M9 will give you that choice by using a larger or smaller aperture." What should one do to get smaller aperture = larger depth of focus with the M9's fixed aperture selfie cam? M9 all the ways. I also prefer narrower lens. I hate distorsions in wider lens. Yeah but the M9 is doing a bit stretching on the fellows head still. M9 is better But both have a problem.Mate7 selfies look greener and M9 has more red in it. I want a normal lens for the front facing, why would you want it to be wide angle? Makes no sense for use... Plus I want a normal lens on the rear facing too, If I cannot change the lens I always want it to be normal since it will give the best results in most situations. Wide Angle is great and all but the distortion that comes with it is not something you want in every shot. "why would you want it to be wide angle?" Hmmm let's see. 1. larger aperture for same glass elements, better low light. 2. Easier to image stabilize. 3. Easier to frame your subject (think group photos). Why compare M9 to a substandard chinaphone? it's a mismatch.